What will you do if you have to search for your clothes from a big pile? You will start rummaging through the pile to look for them! In this free, printable critical thinking worksheet, you will do the same. JumpStart 'Search for Your Clothes' is a fun critical thinking worksheet for 4th grade. 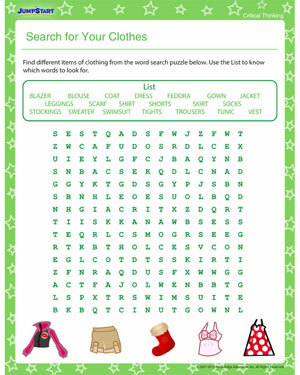 Kids will rummage through the letters in the word search puzzle to find their clothes in this fun and engaging worksheet. Bring it home! Check out more such free critical thinking worksheets for kids now!